"Energy is the golden thread that connects economic growth, environmental health, social fairness and opportunity." Sustainable cities are economically productive, socially (and politically) inclusive, and environmentally sustainable. In other words, they must promote efficient economic activities, ensure that all citizens can benefit from them, and must do so in a way to preserve the biodiversity, safe air and water, and physical health and safety of the citizens. In this context, sustainability of cities can be achieved by building capacities to adapt to policy priorities and goals related to social development, economic development and environmental management. Under social development, policies for green housing and buildings, green public transportation and green energy access need to be made. For economic development, goals such as production and distribution of renewable energy and technology and innovation (R&D) are need to be attained. In managing environment, waste, recycling and energy efficiency areas call for attention. In this increasingly urbanizing world, a more sustainable way of living is demanded, and promotion of efficient urban planning and sustainable environmental management to enhance policy coordination and to reduce ecological footprints is inevitable. Green and renewable energy can make a major contribution in this regard by responding to a growing global demand for energy services and by reducing negative impacts associated with current production and use. In addition, new energy sources have other social and environmental benefits, including mitigating health problems and impacts on ecosystems caused by extraction, transportation, processing and use of conventional fuels. Another aspect to note is that a shift to renewable energy sources will bring green global economic development along with many new employment opportunities when properly approached with integrated strategies especially for rural areas in developing countries where the majority of the poor live in energy poverty. This training will present ways and strategies for a transition to green energy solutions to tackle imminent environmental and energy issues faced by developing countries in particular. 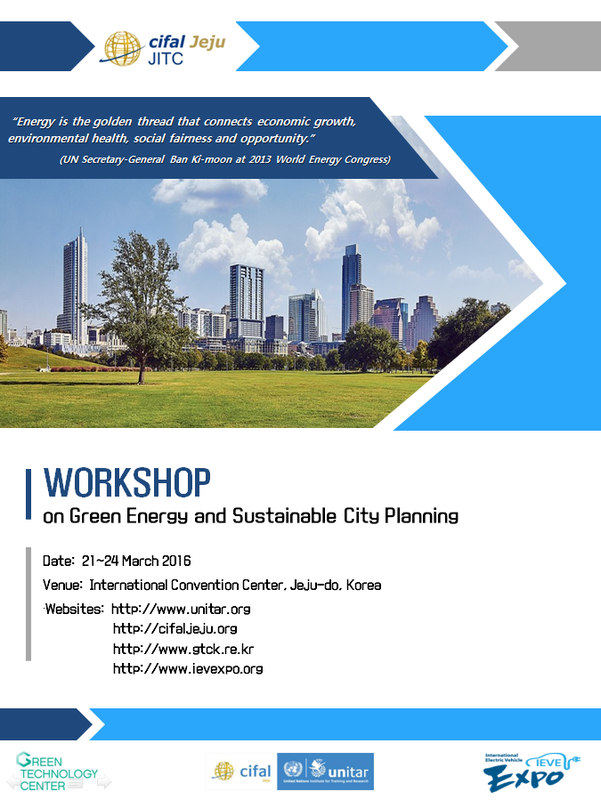 It also aims at satisfying the needs for the adoption and application of green energy technologies and concepts for sustainable city planning through active networking among experts and participants. The training program is being shared with the 3rd International Electric Vehicle Expo in Jeju to highlight the use of electric vehicles as a successful example for restoring environment as well as improving energy efficiency. It will be useful for participants to acquire in-depth knowledge of how to design and tailor policy frameworks which encompass the diversity of circumstances among countries. • demonstrate basic understanding of green technology transfer and soundly constructed cities. The "CityShare methodology"aims at optimizing peer learning between local officials and other local stakeholders playing crucial roles in ensuring sustainable municipal development. The methodology consists of various processes of self-assessment, distillation, and transfer of challenges, lessons learned, and good practices between local stakeholders and resource persons. It is also composed of several tools to provide a common framework for the evaluation of experiences made by the participating cities and offer a common language for the exchange and assimilation of experiences, as well as a roadmap for action and progress. • submit necessary documents on time, i.e., registration form etc. • complete and submit pre-training readings and assignments, i.e. case studies etc. UNITAR and UNITAR CIFAL Jeju/JITC will jointly issue a certificate to participants upon completion of the full program. • Application without required documents will not be considered. • Participation is subject to approval of the application by UNITAR CIFAL Jeju/JITC. • Selected applicants will be notified individually. • UNITAR CIFAL Jeju/JITC provides LIMITED (please see the agenda) financial assistance with the airfare to Jeju-do, Republic of Korea. • Local expenses (transportation, accommodation and meals) during the workshop will be covered. • All other expenses are the responsibility of the participants.